Boyfriend, while holding the positions of both muse and taste-tester of my baking creations, rarely gets the honor of having anything baked specifically for him. Even though he’s usually the one to come up with the idea for flavor or presentation, the finished product gets whisked off to work for my coworkers to enjoy, leaving him to sample those left behind, usually the ugliest of the bunch, if he even gets any at all. Yeah. I know. I’m a terrible girlfriend. A couple weeks ago, my TV converter died. (I’m too poor for cable.) Boyfriend, like always, came to the rescue, giving me his. I’m sure this was merely to avoid a serious meltdown when I couldn’t watch my shows, but I was grateful. (Because, really, I NEED to watch The Biggest Loser and Glee. Not want. Need. Desperately.) The only thing he asked for as payment was a batch of Toffee Blondies. Well, it took me a month, but I finally paid him back! I’d made these for Boyfriend before—back in the pre-blog days—and apparently they were pretty memorable if he was asking for them again 2 years later! Honestly, I’m kind of surprised he even remembered them at all, since they were devoured by his roommates in about a day. Baked goods in a house of 3 boys don’t stand a chance. But they must have made a good impression! From what I could remember of them before, the recipe as it was written seemed almost too sweet for me. Baking them this time, I decided to cut the sugar down by ¼ of a cup to mellow it out a tiny bit. They’re still best with a tall glass of milk because they’re really rich, and it’s a good idea not to eat them as a midnight snack, because they’ve still got enough sugar in them to keep you up all night (trust me), but I think they were better this time around. They’re super thick and perfectly chewy, and with 2 and a half sticks of butter, they’re completely indulgent. Paula Deen would approve. You may want to cut them into even smaller bars, because believe me, you can't eat just one. Even if you're completely dazed in a sugar coma, you'll be back for more. 1. Preheat oven to 350F. Butter a 9x13-inch baking pan. Line the pan with parchment, leaving a 2-inch overhang on the long sides; butter and flour the parchment. 2. 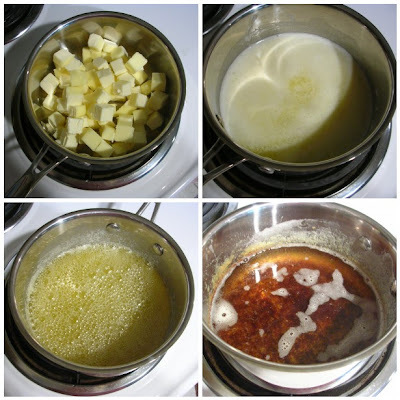 In a saucepan over medium heat, cook the butter until it turns golden brown, skimming off the foamy solids with a spoon. Remove from heat and let cool. While cooling, in a medium bowl, whisk together flour, baking powder, and salt; set aside. 3. In the bowl of an electric mixer, combine cooled browned butter, brown sugar, and granulated sugar, stirring together with a wooden spoon until combined. Attach the bowl to the electric mixer, fitted with the paddle attachment, and add eggs. Beat on medium high speed until light and fluffy, about 3 minutes. Add vanilla and beat until combined. Add flour mixture, a little at a time, beating until just combined. Add in 1 cup of toffee bits and mix on low until just combined. Pour batter into prepared pan, and spread evenly with an offset spatula, smoothing top. Sprinkle remaining 1/3 cup of toffee bits over top of batter. 4. Bake, rotating halfway through, until a cake tester inserted in the center comes out clean, 35 to 40 minutes. Transfer to a wire rack to cool completely. Using parchment overhang, remove from pan and place on a cutting board to cut into squares with a serrated knife. I made these a few weeks ago and they were a huge hit. Soooooo rich, but soooooo good! lol Ingrid- I can (and did) eat a whole one too! lol that's why I suggest cutting them smaller.. So when you go back for seconds (because you will), you won't feel as guilty! I love blondies of all kinds. Love the brown butter here. I cant wait to make/eat these. My boyfriend keeps telling me i am trying to make him fat, he never says no to tasty treats though.